Meanwhile, drain tofu; gently press between layers of paper towels to remove excess moisture. Cut tofu into 3/4-inch cubes. Heat grill. In large bowl, combine 3 tablespoons of the stir-fry sauce and oil; mix well. Add tofu; mix gently to coat. Add broccoli, onions, carrots, mushrooms and snow pea pods; toss to coat. Spray grill basket with nonstick cooking spray. When ready to grill, place grill basket on gas grill over medium-high heat or on charcoal grill 4 to 6 inches from medium-high coals. Place tofu mixture in grill basket. Cook 10 to 12 minutes or until vegetables are crisp-tender, tossing occasionally. In small bowl, combine remaining 1 tablespoon stir-fry sauce and 1 tablespoon water; mix well. Place cooked vegetables in serving bowl. Add sauce mixture; toss to coat. Serve vegetables over rice. For this recipe, use a work-style grill basket. Its sloping sides and small holes keep small pieces of foods inside. To prepare this recipe on the stovetop, use a large nonstick skillet or wok sprayed with nonstick cooking spray. Do not mix oil and stir-fry sauce. Heat sprayed skillet or wok over medium-high heat until hot. 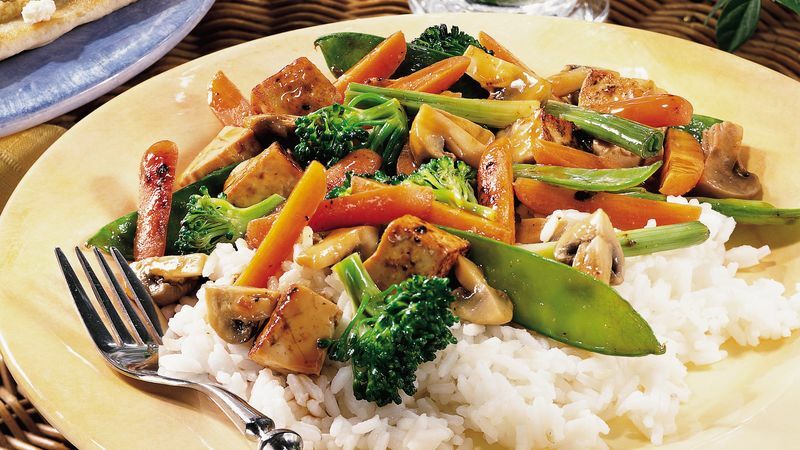 Lift tofu out of stir-fry sauce and place in skillet or wok. Cook tofu 6 to 9 minutes or until lightly browned on all sides, turning carefully with pancake turner. Remove tofu from skillet or wok. In same skillet, heat oil over medium-high heat until hot. Add broccoli, onions, carrots, mushrooms and snow peas; cook and stir 4 to 6 minutes or until vegetables are crisp-tender. Return tofu to skillet. Add remaining stir-fry sauce and toss to coat tofu and vegetables.